Hair loss is about more than just losing your hair. Men can feel powerless and even vulnerable as they notice their hairline receding. Younger men report feelings of anguish as they realise they can’t achieve hairstyles they once enjoyed. This is why the FUE hair transplant is one of the most popular cosmetic procedures for men in 2017. Depending on your personality and age, hair loss affects men in different ways. Some men put up a shield and try not to think about the problem while others tell us they overcompensate in other areas to try and regain control. But there’s one thing that everybody agrees on; that hair loss is a problem they’d rather do without. Research shows that balding men are regarded be observers as less attractive, older, less successful and not as approachable as those with a full head of hair. Here at Smileworks we understand your feelings of distress and our surgeons are proudly serving the men of Liverpool with ultra-refined surgical hair transplants that guarantee long-lasting and natural-looking results. So whether you’re looking to restore lost volume in your crown or create an entire new hairline, you can be confident in your Smileworks surgeon to transform your look and create optimism and confidence in your future. FUE is a leading-edge method of hair restoration that transplants individual follicles from the donor area at the back of the head into the hairline or crown. It is by far the most effective way of getting the maximum value out of each and every donor hair – thus creating a longer lasting and aesthetically perfect result. 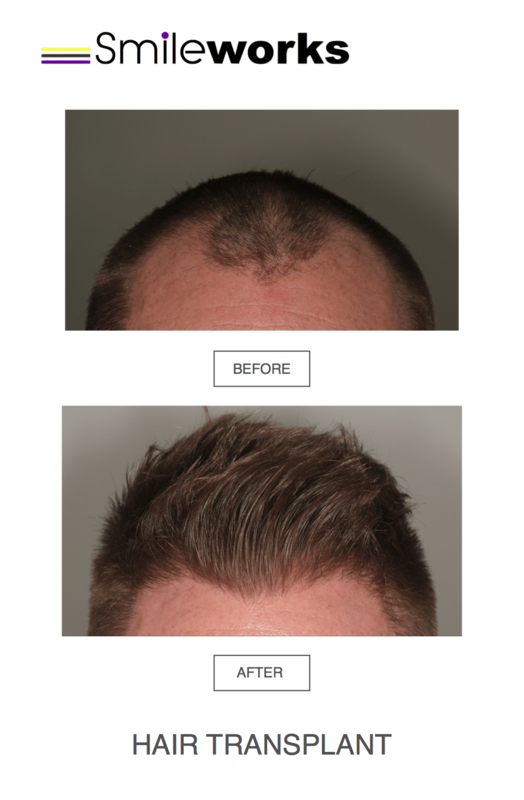 FUE is a more advanced method of hair transplants than previous techniques like strip harvesting transplantation or FUT (Follicular Unit Transplantation). Your surgeon will use a specialised micro-extraction instrument and powerful microscope to remove donor follicles from the back of the head and neck and replace them into the desired area. Your Smileworks surgeon is careful to transplant the donor hairs at the correct angle and orientation to create natural looking results that you’ll be delighted with. FUE is a minimally invasive surgical procedure that is carried out under local anaesthetic with you awake throughout. There is limited downtime and the risk of complications is small. Unlike previous forms of hair transplantation, FUE causes no scars and you will be back at work within a week. Andro-genetic alopecia (AGA) is caused by three different factors. These are your genetic composition, your hormones and time. In isolation all these factors are perfectly normal and healthy. However when they are combined they cause men to lost their hair. Testosterone is the hormone present in all men that makes them male. Some men have more testosterone than others but testosterone alone does not cause your hair to fall out. In certain men, an enzyme called 5 alpha-reductase II can cause testosterone to be converted into dihydrotestosterone, commonly called DHT. DHT causes the root of genetically susceptible hair to disappear, resulting in baldness. The process described above takes time. This is why older men are more likely to suffer hair loss. However, it can still occur in men in their twenties, and this can cause distress – and often these men seek treatment from a surgeon. Men react differently to losing their hair and there is a large volume of research based around how hair loss affects you and your confidence. There’s also plenty of research surrounding how hair loss affects what others think about you. Men report feeling powerless over their hair loss and feeling older and less attractive. Interestingly the perceptions of baldness reflect this and recent research from John Hopkins School of Medicine found that men with androgenic alopecia (pattern baldness) who underwent hair restoration surgery were regarded by observers as more attractive, youthful, successful and approachable. Successful hair transplants are also related positively to success in the personal lives of men and also in their work lives. Following your initial telephone call to arrange your booking, you’ll receive a warm welcome at our state of the art Liverpool practice. You will be taken into a private consultation room with our Trichologist who will examine your scalp, take a medical history and tell you all about what to expect from your treatment and what can be achieved in your individual case. You’ll be educated about hair loss and all of your questions will be answered about what the problem is, how to fix it and how long it will take. You’ll be graded on the ‘Norwood Scale’, this is a technical scalp mapping system that diagnoses hair loss and serves as an initial guide for us to work from. Here at Smileworks we have state of the art imaging techniques that will allow us to take a detailed look at your scalp and show you on a monitor what the problem is and how your hair loss is progressing. Following this analysis, your trichologist will be able to give you a quote for how many follicles you’ll need to have replaced and how many treatments you’ll need with the surgeon. In rare and difficult cases, images of your scalp will be examined prior to your main consultation for Dr Kienecker to report on. I was so relaxed during the surgery that I almost fell asleep! I would recommend them to anyone considering a hair transplant. Thank you all so much again, and see you in a few months for the next set of pictures. I'm pretty happy with the way it's starting to look and hopefully it still has some more to grow. I recommend Dr. Ulf Kienecker as a professional highly skilled hair transplant surgeon. I have found him to be a dedicated competent and compassionate physician. Dr. Ulf Kienecker's expertise and extensive knowledge in the field of hair restoration is nothing short of remarkable providing the best service to his patients." Here at Smileworks we believe that FUE hair transplantation is more art than science. Our surgeons are masters at creating age and face-appropriate hairlines that look perfectly natural and leave our patients feeling optimistic and once again able to wear different hairstyles. Our talented hair surgeons are able to work with patients at all different stages of hair loss with precision and flair to create the best results. Our surgeons have seen many bad attempts at hair restorations over the years and are consequently less focused on the speed of the procedure and more on attaining a perfect look – so you can wear your hair precisely the way you want to. Most FUE transplants can be completed in one day. Following your consultations you’ll finish any documentation and begin the procedure. First you’ll be settled into the operator and your donor areas will be shaved to reveal the follicles to the surgeon. Your scalp will be fully anaesthetised with local anaesthetic. This will mean you don’t feel a thing during your procedure. Once the local has taken effect, a tiny punching tool will be used to remove the donor follicles. As more follicles are removed, they will be graded, separated and examined by our specially trained technicians. Our surgeons can remove up to 8,000 follicles in a session. The follicles are then transplanted with precision and care by your surgeon. Once all the donor follicles are transplanted you can return home and begin the recovery process. In the past, many sessions were required to perform a successful hair transplant procedure and these sessions were spaced months apart to allow time for healing. This placed a demand on the surgeon’s abilities and also placed huge demand on the amount of staff and technicians involved in the procedure. These days the procedure has been streamlined and surgeons are benefitting from procedures that increase the speed and accuracy of the follicular transplants. 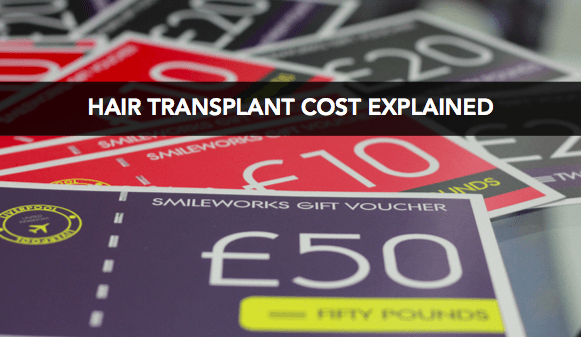 Here at Smileworks we have a number of technicians who can prepare the grafts and your transplant can be carried out in one or two sessions depending on the extent of your pattern baldness. Our surgeons are masters of such hair restoration ‘mega-sessions’ and can place the grafts close together while maintaining an extremely high follicle survival rate. The results of a hair restoration are not visible immediately. The transplanted hair follicles are dormant while their blood supply develops and the area heals. This healing period lasts three to four months before the new hair shaft begins to grow. Depending on the individual, some of the hair follicles will take longer to begin growing and you may not see results for up to six months. There is no way to increase this time and any hair restoration company that tells you it can happen more quickly is likely exaggerating things. What is for sure is that your Smileworks hair restoration procedure will be finely optimised, choreographed and executed to give you and the donor follicles the best chance of success. In younger patients, we can also provide additional non surgical hair restoration therapies that can prevent further hair loss and stop the process in it’s tracks. Some follicles have not died but only become ‘miniaturised’ and can be brought back to health with various techniques. It’s this holistic approach that’s given our patients such marvellous results. You’ll leave Smileworks with all the information you need to recover in the quickest possible time. This includes instructions on how to manage discomfort, how to wash your hair and what to do if you notice anything out of the ordinary. There will be some swelling and discomfort immediately after the procedure and it’s often a good idea to take a few days off work next to the weekend to rest and recover. You’ll be instructed not to touch your new grafts for the first 6 days following treatment and then to start washing your scalp as normal. There will be small scabs at the treatment sites and your hair will have been shaved at the donor site so it will be noticeable. After day 10 the tiny scabs should all be gone and things will look normal again to most people. For people who know you well they may still wonder about the shaved area if you haven’t told them about your hair restoration. Many patients grow their hair long at the back to cover the donor site. All the women who have treatment do this. After 3-4 weeks you will be completely recovered and your hair will begin the growing in process that takes between 4-6 months.